This small rug, fitted to display on the wall, is the perfect way to brighten winter days. The heart is a theme I return to with regularity, working it out in different ways each time. The vivid gold border was created by using a striped wool that lends variety to the background and makes this a very exciting little rug. 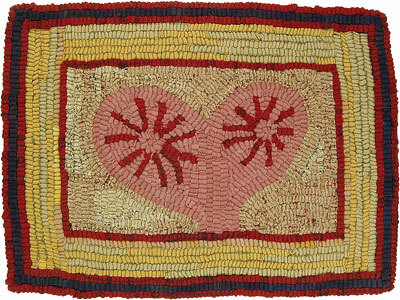 Commissioned heart rugs are most welcome. They’re the perfect gift for someone you love.